The midterms "were previously a big yawn and this year they are more like a scream," said Susan Dzieduszycka-Suinat, president of the U.S. Vote Foundation. LONDON — Mike DePinto was not involved in politics when he lived in the U.S. and he's previously voted for candidates in both parties. That changed last month. Feeling upset with the country's leadership, the former Los Angeles resident decided to volunteer for Democrats Abroad. 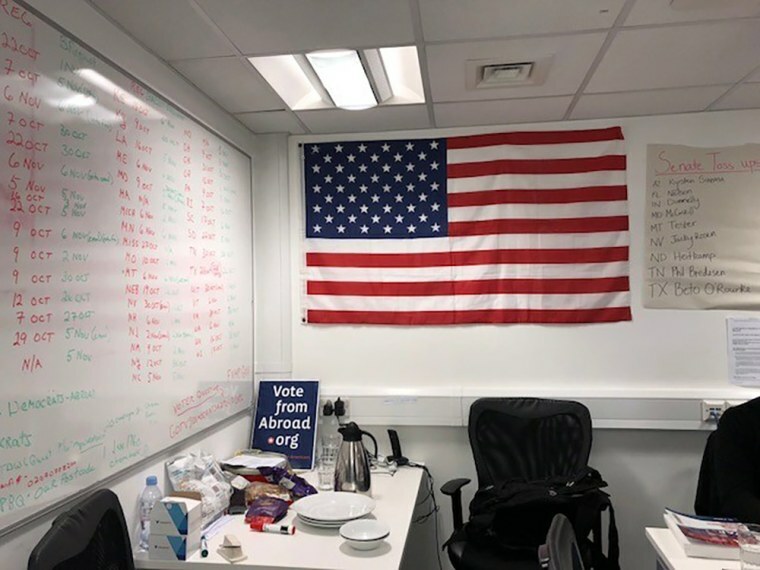 He now comes to the group's U.K. campaign office four or five evenings a week, calling Americans in the Democrats Abroad database and reminding them to vote in the midterm elections. "I feel like this election is determinative," said DePinto, 54, who moved to London a year ago to be with his wife who got a job here. Though midterm elections are typically shrugged off by Americans overseas, not this year. An unprecedented number of Americans living outside the U.S. have requested ballots, up seven times over the last midterm election in 2014, according to data from the non-partisan U.S. Vote Foundation, which registers a large portion of overseas voters. The group declined to disclose the number who had requested ballots. "The midterms for overseas voters until this year have gone largely unnoticed. They were previously a big yawn and this year they are more like a scream," said Susan Dzieduszycka-Suinat, president and CEO of the U.S. Vote Foundation and Overseas Vote. "There have been some days where our (website) traffic in comparison to 2014 has been up 2,500 percent on just the overseas site," she added. "It's unprecedented for a midterm election and a real indicator that overseas voters are really paying attention." With so many toss up races around the country, the overseas vote could matter. There were an estimated 5.5 million U.S. citizens living abroad in 2016, with approximately 3 million of them eligible to vote, according to the Federal Voting Assistance Program. Voters register in the state where they last lived and rules vary from state to state on how and when to send in ballots. Even with an upswing in ballot requests, citizens overseas are much less politically engaged than Americans living in the U.S. In the last election, American expatriates had a voting rate of 6.9 percent, just a fraction of the participation rate in midterm and general elections. Online registration has made it easier than ever to request a ballot, and voting organizations hope that will translate into increased overseas voter participation in the next few years. Americans can be found in 170 countries around the world, with the largest concentrations in Canada, the U.K., Mexico and France. With ties to the Democratic Party in the U.S., Democrats Abroad has 150,000 people in its database and 12,000 volunteers. This year, interest in events and volunteering have rivaled what they see in a general election year, organizers said. In comparison, Republican overseas organizations seem to be less active and unaffiliated with the national party. Republicans Overseas in the U.K., where it is estimated there are nearly 80,000 eligible American voters, has around 1,000 members. That, however, doesn't necessarily mean there are fewer GOP voters abroad. Organizers said that interest and participation in GOP events has gone up this year, though they couldn't provide exact numbers. Victoria Ferauge has lived overseas for 25 years and hasn't voted in an election for at least the last five years. This year, she registered to vote in Washington on the last day possible and plans to support the Republicans on her ballot. "It's become clear to me that if we don't vote, they aren't going to listen to us and there are some issues on the table that are important to me personally," said the Paris resident, who also serves as the vice president of communications for the non-partisan support organization, Association of Americans Resident Overseas (AARO). She's particularly upset with current U.S. regulations that she says makes it difficult for Americans to open bank accounts and invest money both in the U.S. and overseas. But what really swung her decision was the lack of response by the Democratic incumbents in her home-state to an AARO questionnaire on issues important to overseas voters. While opposition to President Donald Trump has motivated many overseas voters, others have been driven by a desire to change what they feel are draconian American tax laws. U.S. citizens are obligated to report their earnings and potentially pay tax even if they aren't living in America. "Just because you move, doesn't mean you stop being American," said Stephanie Ryde, 27, who grew up just outside Pittsburgh. Ryde moved to London to be with her British husband and started volunteering with Democrats Abroad after feeling frustrated with the 2016 election result. "There is a big difference you can make," she said.